As the fighting in Libya continues, the legacy of an armed conflict more than three decades ago on the Mediterranean island of Cyprus has brought teenagers from the two communities together in a unique commemoration. For the first time, Greek and Turkish Cypriots have come together to share their common grief. Many of them are relatives of the hundreds of people who were killed or went missing during the island's conflicts in the 1960s and 70s. Teenagers gathered to chant for peace on a windy hillside outside Nicosia. Around 100 Greek and Turkish Cypriots formed a circle of commemoration to remember those killed during the years of violence in Cyprus during the 1960s and 70s - the intercommunal bloodshed and the Turkish invasion that followed. Flowers are placed in the circle by those who lost relatives in the conflict. What is significant about this event is that Greek and Turkish Cypriots have chosen to commemorate their losses jointly - and to acknowledge that each side has suffered. Most, like Turkish Cypriot Hakan, are too young to remember the bloodshed. "I never actually got to know my grandfather - he died way before I was born and I think I would have liked to meet him," he says. "Both sides lost, both sides didn't get a chance to meet their grandparents. At this stage I'm not looking at who is Greek Cypriot, who is Turkish Cypriot. It is just people that have lost people that they would have liked to meet." Peace activists in Cyprus refer to a selective amnesia that has characterized each sides' version of history. Greek Cypriot teenager Stefanos said the "main problem is that most people in Cyprus, Greek and Turkish Cypriots, only hear one side of the story, they only hear about the pain and suffering that their own side has experienced. "We have both suffered, we have missing people on both sides, and we have both lost people we love," he says. "It is time now to move on, we have to unite. We cannot continue hating each other and the only way to move on is to know the truth from both communities." The organisers hope that the next generation of political leaders in Cyprus will be as broad minded as these teenagers - and will break down the mutual suspicion that has infected political efforts to solve the Cyprus problem thus far. Η Πλατφόρμα στηρίζει το φεστιβάλ της νεκρής ζώνης. Αυτές τις μέρες έτυχε να πάρω στα χέρια μου ένα ημερολόγιο των που εξέδωσε για τα μέλη της η τουρκοκυπριακή συντεχνία των παιδαγωγών δημοτικής εκπαίδευσης (KTÖS) και το οποίο δεν μπορώ να αφήσω να μη σχολιάσω. Δεν είναι ένα συνηθισμένο ημερολόγιο। Δεν έχει φωτογραφίες με ζώα ή άνθη ή πτηνά της Κύπρου। Υπάρχουν φωτογραφίες μαθητών των δημοτικών σχολείων από διάφορα χωριά πριν από το 1974। Φωτογραφίες μαθητών από τη Λεμεσό, την Κοφίνου, την Αμμόχωστο, τη Δρομολοξιά και άλλα χωριά της επαρχίας Λάρνακας. Ως εδώ, μπορεί κάποιος να πει ότι τίποτα νεώτερο δεν μεταφέρει. Κι’ όμως: δίπλα από κάθε φωτογραφία υπάρχει ένα ποίημα. Τουρκοκύπριοι ποιητές, αλλά και… έλληνες ποιητές. Ο Καβάφης και ο Ρίτσος. Οι μήνες γραμμένοι σε τρεις γλώσσες: Αγγλικά, Τούρκικα, Ελληνικά. και μες τα ίδια σπίτια αυτά θα ασπρίζεις. Η έκδοση δεν είναι κρατική έκδοση. Είναι της συντεχνίας των δασκάλων. Στην κοινότητά μας η συντεχνία των δασκάλων έχει ασχοληθεί με τέτοια ζητήματα; Κι’ αν όχι, τι έχουν κάνει οι παρατάξεις, ιδιαίτερα η παράταξη της αριστεράς; Μπορούν να εκδώσουν στα ελληνικά και τουρκικά έστω και ένα ημερολόγιο και να το μοιράσουν στα μέλη τους; Το ερώτημα μου είναι το εξής: τα τελευταία δυο χρόνια το υπουργείο Παιδείας τα έχει ανακηρύξει ως χρόνια ανάπτυξης των σχέσεων των ελληνοκυπρίων μαθητών με τους τουρκοκύπριους μαθητές. Τι έκαναν οι ελληνοκύπριοι παιδαγωγοί προς αυτή την κατεύθυνση; Μίλησαν έστω και μια φορά για τουρκοκύπριους ποιητές, μετάφρασαν έστω ένα ποίημα τους και να το διαβάσουν στους μαθητές τους; Να μεταφέρουν στους νέους μας τις ιδέες και τις αντιλήψεις των πνευματικών ανθρώπων της άλλης κοινότητας; Και γιατί το κράτος δεν παρεμβαίνει πιο αποφασιστικά; Πως θα γνωρίσει η νέα γενιά μας τον πολιτισμό της άλλης κοινότητας; Λέμε θέλουμε να ζήσουμε μαζί, αλλά δεν κουνούμε το μικρό μας δακτυλάκι για να προετοιμάσουμε τη νέα γενιά, να τις δημιουργήσουμε το κλίμα της αποδοχής και της ειρηνικής συμβίωσης και συνεννόησης. Έχουμε μετατραπεί σε μια άτολμη κοινωνία, κλειστήκαμε στον εαυτό μας, δεν κοιτάμε πέρα από το στενό και ιδιοτελές συμφέρον. Θέλω να συγχαρώ τη συντεχνία των τουρκοκυπρίων δασκάλων που ακολουθούν τη μοναχική τους πορεία, έστω κι’ αν οι ελληνοκύπριοι συνάδελφοι τους κωφεύουν। Δεν είναι τυχαίο που οι τουρκοκύπριοι δάσκαλοι βρίσκονται στην πρώτη γραμμή και αγωνίζονται για επανένωση της μικρής μας πατρίδας. Το όνομα τους, το επάγγελμα τους και η συνδικαλιστική τους οργάνωση βρίσκονται ψηλά στη συνείδηση των τουρκοκυπρίων συμπατριωτών μας, αλλά και σε μια μεγάλη μερίδα των ελληνοκυπρίων, που συνεχίζουν να αγωνίζονται για την επανένωση της χώρας μας στη βάση της ομοσπονδιακής δομής του κράτους και της πολιτικής ισότητας των κοινοτήτων. Κ.Π. Καβάφης: Ποιήματα. Έκδ. Γ. Οικονόμου, παρουσίαση Γ. Πικρού. The ‘Platform’ formed by 28 trade unions with aims of eliminating the deadlock on the Cyprus problem; establishing the United Federal Cyprus within the framework of UN parameters; realising self-governance by the Turkish Cypriots and ensuring respect for democracy, human rights and for labour in the land, has been continuing its struggle for many years. All Cypriots suffer as a result of the unresolved Cyprus problem. Because of the failure of the Turkish Cypriot leadership, the Turkish Cypriot community have been regarded as the side which was “against” the solution. Between 2002-2004, the Turkish Cypriot community has been giving a continuous struggle and gathered several trade unions, organizations, institutions and political parties together. With their determination, they impeded the leadership of that period, put the solution plan of the UN Secretary General Kofi Annan to hold a referandum and provided our community to vote %65 YES for the referandum. In particular, we, Turkish Cypriots feel trapped between the Greek Cypriot administration who is unwilling to share the Republic of Cyprus with us and Turkey that strives to colonise north of the island. Even though Cyprus as a whole became a member of the European Union since 2003 and Turkish Cypriots attained EU citizenship, the suspension of Acquis communautaire in the north has left us in the lurch. Our continued exclusion from the EU Customs Union is preventing the growth of our economy and is forcing the youth in north to vacate the island, while it is increasing our dependence on Turkey and bringing us face to face with communal annihilation. Since Greek Cypriot administration does not want to share the Republic of Cyprus with us, we are unable even to use our basic citizenship rights of electing and being elected that exist in the Constitution of the Republic of Cyprus. On the other hand, Turkey is working to colonise the north of the island. And currently, with the agreements of the UBP Government in the north of Cyprus with Turkey, the purchase power of the workers is tried to be eliminated, the wages and salaries are decreased and our trade union and collective bargaining rights are tried to be eliminated and discarded. The events following the intervention of Turkey as a guarantor power to protect the territorial integrity of the Republic of Cyprus and to re-establish the constitutional order after the coup organised in Cyprus by the Greek Junta in 1974, are unacceptable. Not only has Turkey failed to respect the international agreements, she has also brought the Turkish Cypriots to the verge of extinction as a result of its policies and practices since the 1974 intervention. Names of many Turkish Cypriot individuals, as well as names of towns, villages and roads in the north have been changed. Our education system has been restructured and harmonised with the education system in Turkey. Such examples lay bare the assimilationist policies of Turkey. Villages in the Karpas Peninsula have been given the names of some Turkish cigarette brands while Turkish Cypriots have been forcibly required to get surnames. Acting with the zeal and mentality of conquerors, vast populations have been brought over from Turkey to North Cyprus and have been given citizenships, thereby usurping the political will of the Turkish Cypriots. Turkish Cypriots have effectively become a minority in their own country because of the population brought over from Turkey. While the current population in the north of the island is not known with any certainty, and the official figures released are highly distorted, we estimate that there are around 130 thousand Turkish Cypriots and the total population is over 800 thousand. According to the Union of Bakers, 810 thousand loaves of bread are produced daily; there are 400 thousand registered vehicles and 450 thousand mobile phone subscribers. The Separatist puppet regimes established by Turkey in the north of the island, continue to prevent the holding of a genuine census under the supervision of international observers. Such a large increase in our population has created a serious burden on our budgets for education, health and social areas. It is also causing an increase in the unofficial/unregistered economy and has created a large body of non-unionised workforce. Moreover, crime rates in the north have risen to levels never seen before in the history of Cyprus. On the other hand, AKP government in Turkey has intensified its efforts to spread Sunni Islam on our island. In stark contrast to the 162 schools that exit in the north, there are 186 mosques and more are being built. There is pressure from Turkey to build even more mosques and to include Quran course in our education system. To this end, clerics and financial resources are continually sent from Turkey to the north. These developments that are contrary to Turkish Cypriot culture, identity and tradition, are targeted at the assimilation and integration policies by Turkey. In the 21st Century, in a territory of the EU, colonisation and assimilation is being carried out right before the eyes of the modern world. After 1974, Turkish Cypriots who had to leave their properties in the south and Greek Cypriots who had to leave their properties in the north, have, in practice, lost their right to use their own properties. As a result of faulty policies, Greek Cypriots properties in the north of the island had been distributed to Turkish Cypriots and to the population brought over from Turkey, thus creating a terrible system of looting. These policies which are contrary to international law have left us in serious difficulties. We also have serious environmental problems. Unsupervised rubbish landfills are releasing poisonous substances to their surroundings. On the other hand radioactive and carcinogenic materials that are not accepted into any other ports in the Mediterranean basin are regularly dumped in to the free port of Famagusta. Studies indicate that cancer incidences in the Famagusta district are very high. Under the pretext of creating economic resources, casinos that were closed in Turkey were moved to the north of our island. Today all manners organised crime activities such as money laundering, drugs trafficking and women trade are carried out freely in the north. Nothing is being done about these activities that are being carried out on EU territory, right before the eyes of the EU! The separatist political structures set up in the north of the island bear close resemblance to the Vichy government established in France during the Second World War. Through the activities of collaborationist governments, the Turkish Cypriot community have been kept repressed and suppressed. Our youth continue to leave the island because of political and economic reasons. Institutions belonging to the Turkish Cypriots are being handed over to companies from Turkey that are close to the Turkish government. Prime minister of Turkey openly declares that they have “strategic” interests in our Island. In spite of all these impositions we continue our struggle with determination. That we have the support of the Turkish Cypriot community is attested by the 80 thousand people that participated in our Meetings. Our community adopted and proclaimed the 13 principles listed below in these mass meetings of January 28 and March 2 in 2011. In this context we await your contributions for returning law and order to the EU land of Cyprus since 2003 and resolution of the Cyprus problem. 1. The Trade Unions’ Platform is an association of labour organizations for the purpose of protecting and developing the democratic, economic, and social and employee rights of its members. At the same time the Platform aims to overcome all political problems that stand in the way of “self-governance of the community” as well. However, the Platform has no intention to become the government. 2. There is no place for any organizations that are in support of policies and acts that are aiming the extinction of our community, such as those organisations supporting the “Immigration Act”. 3. The Platform supports the urgent solution of the Cyprus problem on the basis of United Nations resolutions, as well as the Turkish Cypriots taking their place in the international arena. 4. The will and the self-governance of the Turkish Cypriots to manage their own affairs must be respected. 5. The relations between Turkey and the Turkish Cypriots, must be based on mutual respect, and must be at the level of political equals. The present state of affairs based on logic of subservience to a master must be ended. 6. The Turkish Cypriots poses the knowledge, the skills and the potential in order to manage their own institutions. Based on this fact the governance of the Central Bank, the Civil Defence Organization and the Security Forces must be handed over to the Turkish Cypriots, while the police and the fire brigade must be brought under civilian rule. 7. For the sake of remaining in government, the ruling National Unity Party has bowed to all the impositions made by the AKP government in Turkey, and surrendered the political will of the Turkish Cypriot people to AKP by succumbing to immorally transfer parliamentarians from another party to its ranks. With its collaborationist policies and hostile attitude toward the Turkish Cypriots, the actions of the ruling UBP is pushing the Turkish Cypriots to extinction. It is because of these reasons that the UBP government does not represent the political will of the community. 8. In its struggle to win back the political will of the Turkish Cypriot people that has been surrendered to the governments of Turkey, the Trade Unions’ Platform expects and calls upon all the opposition parties in the parliament to take every action including civil disobedience with regards to the measures taken by the government and to walk-out from the parliament should the government block all other avenues..
9. The officials of the Republic of Turkey must stop their interfering in our internal affairs, and must put an end to the “shadow cabinet” disguised as advisors. The interventions of the T.R. “Aid Committee” in the political decisions of the government must cease. Financial assistance must be provided on project basis, and must be administered by the Turkish Cypriot authorities. All tenders must be opened and bid in Cyprus. 10. The economic packet imposed purely for political reasons on the Turkish Cypriots within the framework of the protocols signed with the T.R., which does not fit the social and cultural structures, must be stopped immediately and any arrangements made must be revoked. 11. The practice of selling communal wealth and establishments cheaply under the guise of privatization must cease immediately. The authority on these institutions rests with the Turkish Cypriots. 12. The practice of distributing citizenships which has ruined the social, economic and cultural fabric in our country and has wiped out the political will of the Turkish Cypriots, must be stopped immediately. Further, a new census must be carried out under the supervision of international observers and illegal immigrants must be repatriated. Entry in to the country with identity card must be stopped and all future entries must be carefully controlled. 13. The inhumane working conditions of the workers in the private sector must be improved and the ILO regulations must be implemented and enforced both in the public as well as in the private sectors. Κατά τη διάρκεια του επικρατούσε περισσότερος ενθουσιασμός, μετείχε περισσότερος κόσμος και ήταν πιο ποιοτικό σε σχέση με το πρώτο. Τα συνθήματα τα πανό και οι ομιλίες ήταν πιο εντυπωσιακά. Όσον αφορά την αντίδραση της τουρκικής κυβέρνησης θεωρεί ότι ενώ από τη μια δεν εκδηλώθηκε, όπως την πρώτη φορά, με αρνητισμό και βίαιη φραστική καταδίκη, από την άλλη πίσω από την ήπια στάση που κράτησε στο διάστημα που μεσολάβησε, άφησε σκόπιμα να επικρατήσει η υποβολιμαία αντίληψη ότι δήθεν οι διοργανωτές του συλλαλητηρίου δεν έχουν προκαταλήψεις κατά της Τουρκίας και ότι εγκρίνουν την πολιτική της τουρκικής κυβέρνησης. Μια πρώτη έμπρακτη εκδήλωση των προθέσεων της τουρκικής ηγεσίας, έγινε στην πόλη Αναμούρ της Ν. Ανατολίας με την ευκαιρία τελετής κατάθεσης θεμέλιου λίθου για την κατασκευή υδατοφράκτη από τον οποίο προγραμματίζεται να υδροδοτηθεί ο βορράς. Εκεί ο Ταγίπ Ερτογάν προέβη σε επαινετικά, μέχρι υμνητικά, σχόλια για τους τ/κ, αφήνοντας έτσι να διαφανεί μια εντελώς διαφορετική αντιμετώπιση του δεύτερου συλλαλητηρίου. Επιδίωξε να επιδείξει μια πιο προσεγμένη και ώριμη στάση, σε μια προσπάθεια να ιδωθούν οι αντιδράσεις της τ/κ κοινότητας κάτω από ένα θετικό πρίσμα. Την ίδια όμως στιγμή στο περιθώριο της εκδήλωσης, κατά την οποία προσεκλήθη σύμπασα η τ/κ ηγεσία, έγιναν διαβουλεύσεις για τον τρόπο κατασταλτικής αντιμετώπισης των τ/κ εξεγέρσεων με τη λήψη νέων, πιο αποτελεσματικών, μέτρων. Η προετοιμασία του συλλαλητηρίου δεν προκάλεσε κανένα ιδιαίτερο πρόβλημα στους συνδικαλιστικούς φορείς που το διοργάνωσαν Έγινε, όπως και το προηγούμενο, στα δημοκρατικά πλαίσια που συνηθίζεται να λειτουργούν. Για το λόγο αυτό θα ήταν μεγάλο λάθος να αγνοηθεί η λαϊκή θέληση που εκφράστηκε σ’ αυτό, η οποία σε παρόμοια περίπτωση θα ήταν πιθανό να εξελιχθεί σε λαϊκή οργή, όπως τη βλέπουμε να εκδηλώνεται στις γειτονικές χώρες της βόρειας Αφρικής. Μια κατάσταση δηλαδή που η ηγεσία της συνδικαλιστικής πλατφόρμας δεν θα μπορούσε να εγγυηθεί ότι θα της ήταν δυνατό να συγκρατήσει. Η Τουρκία προσπαθεί να επιβάλει μια ρητορική που στοχεύει στην παραπλάνηση και διαίρεση των τ/κ με απώτερο σκοπό την αφομοίωση τους, όπως και την ενσωμάτωση των κατεχομένων εδαφών. Για την υλοποίηση μιας τέτοιας πολιτικής είναι πολύ πιθανόν το προσεχές διάστημα να υπάρξουν κάποια ευνοϊκά μέτρα, όπως η υδροδότηση, η χαλάρωση στην επιβολή του οικονομικού πακέτου κλπ, με σκοπό την παραπλάνηση των λαϊκών στρωμάτων της κοινότητας. Παράλληλα ακολουθώντας πιστά το δόγμα των Άγγλων αποικιοκρατών «διαίρει και βασίλευε», αναπτύσσει τη ρητορική της διάσπασης με το να αφήνει να διαδίδεται ότι τάχα το πρόβλημα των τ/κ είναι καθαρά οικονομικής φύσης και αφορά μονάχα ένα μικρό μέρος του πληθυσμού. Τα αιτήματα των τ/κ, όπως αυτά διατυπώνονται μέσω της πλατφόρμας, κωδικοποιήθηκαν σε μια διακήρυξη αποτελούμενη από13 σημεία. Πρώτο αίτημα είναι αυτό της αυτοδιοίκησης. Ένα ξεκάθαρο αίτημα, όπως καταγράφηκε με πολλούς τρόπους στα πανό των κινητοποιήσεων, με στόχο την απαλλαγή από την τουρκική κηδεμονία και την ανάληψη μιας καθ’ ολοκληρίαν αυτόνομης διακυβέρνησης. Το δεύτερο αίτημα αφορά τη λύση του κυπριακού στα πλαίσια των αποφάσεων των Ηνωμένων Εθνών με τη μορφή Διζωνικής Δικοινοτικής Ομοσπονδίας. Τρίτο αίτημα, αντίποδας των σχεδίων αφομοίωσης, αναφέρεται η επείγουσα ανάγκη για απογραφή του πληθυσμού στην παρουσία διεθνών παρατηρητών. Η διακήρυξη συμπληρώνεται με μια σειρά πρακτικών μέτρων στους τομείς της παιδείας, υγείας κλπ. Με χρονικό ορίζοντα τις 25 Μάρτη, ο αγώνας των τ/κ θα συνεχιστεί με διάφορες μορφές κινητοποιήσεων. Η πρώτη μορφή, πέραν των συλλαλητηρίων, είναι οι απεργίες. Συνεχίζονται ήδη οι απεργιακές κινητοποιήσεις στα δικαστήρια και τα ληξιαρχεία, ενώ επίκειται απόφαση για το αν οι απεργίες θα επεκταθούν και στην αρχή ηλεκτρισμού, νοουμένου ότι η κυβέρνηση αγνοώντας παντελώς τα μηνύματα των συλλαλητηρίων συνεχίζει την πολιτική των ιδιωτικοποιήσεων και την εν γένει επιβολή του πακέτου οικονομικών μέτρων. Με τη λήξη της προθεσμίας (25/3/2011), αν η κυβέρνηση δεν πάρει πίσω τα μέτρα ή δεν δηλώσει την παραίτηση της οι κινητοποιήσεις θα κλιμακωθούν με νέα πιο μαζικά συλλαλητήρια μπροστά στο κτίριο της Βουλής. . Στις περαιτέρω ενέργειες των συνδικάτων εντάσσεται η προσεχής μεταφορά των εκδηλώσεων εκτός Κύπρου με αρχικό προορισμό τα θεσμικά όργανα της Ευρωπαϊκής Ένωσης. Όπως τονίζει εμφαντικά ο συνδικαλιστής ηγέτης, η Ε.Ε. θα πρέπει να αναλάβει τις ευθύνες της απέναντι των τ/κ μιας και ο βορράς αποτελεί έδαφος που εντάχθηκε μεν στην Ε.Ε. το 2004, δεν τέθηκε όμως ακόμη σε ισχύ το ευρωπαϊκό κεκτημένο. Οι τ/κ νοιώθουν Ευρωπαίοι πολίτες (έστω κι αν τυπικά τους το αμφισβητούν) και ζητούν την προστασία των ευρωπαϊκών θεσμών απέναντι στα παιγνίδια «απορρόφησης» που εφαρμόζει παρά τη θέληση τους εδώ και καιρό η Τουρκία. Με αφορμή την ερώτηση για μια πιο αποτελεσματική αξιοποίηση της συμπαράστασης των τ/κ στο εξωτερικό (Κων/πολη, Λονδίνο κλπ) με ανάλογες εκδηλώσεις, ο Σ. Ελτζίλ θα αδράξει την ευκαιρία για να διατυπώσει τη θέση του σχετικά με την ανάγκη συμπαράστασης από τη μεριά των ελληνοκυπρίων. Αν θέλουμε (και οι δυο κοινότητες) λύση, τότε δεν πρέπει να βγαίνουν στους δρόμους μόνο οι τουρκοκύπριοι. Είναι πολύ σημαντικό για τον αγώνα που διεξάγεται από τους τ/κ να ακουστεί την ίδια στιγμή και η φωνή των ε/κ για λύση Ομοσπονδίας και Επανένωσης του νησιού. Είναι μεγάλο λάθος να θεωρείται η όλο και μεγαλύτερη εξάρτηση των τ/κ από την Τουρκία ως κάτι το θετικό για τα συμφέροντα των ελληνοκυπρίων. Αντίθετα η εξάρτηση αυτή, αρχής γενομένης από το 1963, δημιούργησε τον απαράδεκτο διαχωρισμό που βιώνουμε σήμερα. Αν οι ε/κ αποδεχτούν τους τ/κ ως ισότιμους πολίτες σε μια Ομόσπονδη Πολιτεία αυτό θα αποβεί προς όφελος και των δύο. Αν και ιστορικά δεν έχει υπάρξει μια πραγματική συμπόρευση των δύο κοινοτήτων στο πολιτικό πλαίσιο, κανείς δεν μπορεί να αρνηθεί το γεγονός ότι μια αποδεκτή λύση για να επιτευχθεί απαιτεί αμοιβαία θέληση και αγωνιστική συμπόρευση. Ο σημερινός «μοναχικός» αγώνας των τ/κ δεν είναι, όπως η Τουρκία και άλλοι επιμένουν, οικονομικού και μόνον χαρακτήρα. Είναι αντίθετα καθαρά πολιτικός με κύριο άξονα τη λύση. Μόνο η κοινά αποδεκτή πολιτική λύση του κυπριακού θα δώσει τη λύση και στα οικονομικά προβλήματα. Συνεπώς ο αγώνας θα πρέπει να διεξαχθεί και στις δύο πλευρές της πράσινης γραμμής. Μια ταυτόχρονη ανάλογη αντίδραση από τους μαζικούς φορείς στην ε/κ πλευρά θα έδινε στον αγώνα που διεξάγεται αυτή τη στιγμή στους δρόμους και τις πλατείες του βορρά μια άλλη διάσταση. Θα βοηθούσε αποφασιστικά στην υπόθεση της λύσης αφού θα έστελνε το μήνυμα, ιδιαίτερα στο εξωτερικό, πως το αίτημα για επανένωση, σ' ένα αποστρατικοποιημένο νησί, προέρχεται από το σύνολο των κατοίκων του. Πολύ σωστά λοιπόν, ο Σενέρ Ελτζίλ, στο τέλος της συνέντευξης του επισημαίνει και εξηγεί αυτή την «παρεξηγημένη» λεπτομέρεια. Ότι δηλαδή η ελληνοκυπριακή συμπαράσταση δεν αφορούσε συμμετοχή ελληνοκυπρίων στα τ/κ συλλαλητήρια, αλλά μια ανάλογη και ταυτόχρονη κινητοποίηση στις πλατείες της Κυπριακής Δημοκρατίας. Η συνέντευξη ολοκληρώνεται με την απόπειρα να εξηγηθεί η αδυναμία των ελληνοκυπριακών συνδικάτων, ώστε να παίζουν ένα ανάλογο ρόλο στις ε/κ πολιτικές κινητοποιήσεις. Ο τ/κ συνδικαλιστής επισημαίνει την ολοκληρωτική εξάρτηση των συνδικάτων αυτών από τα κόμματα. . Τονίζει μάλιστα τον αρνητικό ρόλο που παίζουν πολλές φορές για τα προσωπικά τους και μόνο συμφέροντα οι πολιτικοί (υποψήφιοι βουλευτές), ιδιαίτερα τις προεκλογικές περιόδους, όπως αυτή που εξελίσσεται το χρονικό αυτό διάστημα στην Κ.Δ. «Το περιστέρι της Ειρήνης δεν πετά με ένα φτερό. Χρειάζεται δύο φτερά». Αν και το ζήτημα αυτό παρουσιάστηκε υποβαθμισμένα στα συλλαλητήρια. Θεωρώ ανοησία να βάζω σε εισαγωγικά τις λέξεις που δηλώνουν τ/κ θεσμούς (δικαστήρια, ληξιαρχεία, βουλή), για να δείξω ότι τάχα σαν ε/κ δεν τους αναγνωρίζω. Επίσης θεωρώ ακόμη πιο αστείο τον επιθετικό προσδιορισμό ψευδό- για κάτι που είναι πέρα για πέρα αληθινό, εκτός ίσως της φαντασίας εκείνων των ε/κ που ενέχονται ιστορικά για τη δημιουργία τ/κ κράτους στον βορρά (ΤΒΔΚ). Η τελευταία φράση που αφορά τους ε/κ ανήκει σε μένα. Για τη τεκμηρίωση του ισχυρισμού μου θυμίζω δηλώσεις προερχόμενες από τα κόμματα, τον Αρχιεπίσκοπο κλπ. Επισημαίνω επίσης ότι η μοναδική εκδήλωση συμπαράστασης από μεριάς των ε/κ μαζικών οργανώσεων στις 2 Μάρτη υπήρξε η εκδήλωση της πλατφόρμας εκπαιδευτικών (ε/κ τμήμα) στο τέρμα της Λήδρας, με πενιχρή συμμετοχή. Είναι πολύ ενδιαφέρον για την εξέλιξη του αγώνα που διεξάγουν αυτή τη στιγμή τα τ/κ συνδικάτα να παρακολουθήσουμε τη στάση των τ/κ πολιτικών κομμάτων μετά το συλλαλητήριο της 2ας Μαρτίου. (Δες μεταξύ των άλλων, το πολύ κατατοπιστικό ρεπορτάζ του Β. Βασιλείου στην εφημερίδα ΠΟΛΙΤΗΣ (17/3/2011, σελ. 6) με τίτλο: «Κλότσησε το ΡΤΚ»). Με ευκαιρία την παγκόσμια μέρα κατά των φυλετικών διακρίσεων στις 21 Μαρτίου, η Αντιφασιστική Πρωτοβουλία καταδικάζει τις επιθέσεις κατά μεταναστών και νέων, τις παρελάσεις εκφοβιστικού τύπου, όπως και τη στήριξη που εξασφαλίζουν ακροδεξιές και νεοφασιστικές οργανώσεις από θρησκευτικούς και πολιτικούς παράγοντες। Εν όψει των βουλευτικών εκλογών, υποψήφιοι βουλευτές από διάφορα κόμματα παρελαύνουν σε τηλεοπτικά κανάλια και διαδίδουν ψευδείς πληροφορίες σχετικά με τον αριθμό των μεταναστών, το ύψος των επιδομάτων που παίρνουν κ.λπ., καλλιεργώντας έτσι τη ξενοφοβία και το ρατσισμό. Πολλά ΜΜΕ όχι μόνο φιλοξενούν ένα ξενοφοβικό λόγο, αλλά συμβάλλουν ενεργητικά στη διαστρέβλωση των γεγονότων, καλλιεργώντας έτσι το ρατσιστικό μίσος. Ο κυπριακός νεοφασισμός, όμως, δεν περιορίζεται σε πράξεις ρατσιστικού μίσους। Επιχειρεί να τρομοκρατήσει και να φιμώσει τη συντριπτική πλειοψηφία του κυπριακού λαού που επιθυμεί ειρηνική λύση του κυπριακού προβλήματος στη βάση της συμβίωσης με τους Τουρκοκύπριους, ενώ παραπλανεί και αποπροσανατολίζει σχετικά με τις δυσκολίες που παρουσιάζονται στην αντιμετώπιση των κοινωνικών προβλημάτων που δημιουργεί η οικονομική κρίση. Ο στόχος των νεοφασιστικών οργανώσεων δεν είναι μόνο οι μετανάστες, αλλά το συνδικαλιστικό και δημοκρατικό κεκτημένο ευρύτερα. Σ’ αυτό το πλαίσιο η Αντιφασιστική Πρωτοβουλία άρχισε τη συγκέντρωση υπογραφών από πολιτικούς και άλλους παράγοντες με σκοπό την ίδρυση ενός ευρύτατου μετώπου που θα απαντά με τη γλώσσα της αλληλεγγύης και της δημοκρατίας στα όποια ξενοφοβικά και ρατσιστικά φαινόμενα και που θα σταθεί εμπόδιο στην ανάπτυξη νεοφασιστικών οργανώσεων στη Κύπρο. Το Πανεπιστήμιο Frederick, σε συνεργασία με τον Όμιλο Προβληματισμού για τον Εκσυγχρονισμό της Κοινωνίας μας (ΟΠΕΚ) και την Κυπριακή Επιτροπή της Παγκόσμιας Οργάνωσης Πρώτης Αγωγής και Εκπαίδευσης (ΟΜΕΡ), οργανώνουν δημόσια διάλεξη με θέμα: "Ανθρώπινα Δικαιώματα και Κοινωνική Δικαιοσύνη: Ο Καθοριστικός Ρόλος της Εκπαίδευσης στο Δημοκρατικό Εγχείρημα". Ο William Ayers βρίσκεται στην Κύπρο ως προσκεκλημένος του Πανεπιστημίου Frederick στο πλαίσιο του χρηματοδοτούμενου από το ΙΠΕ ερευνητικού προγράμματος «Η προφορική ιστορία της Κύπρου». The following article by Niyazi Kızılyürek appeared in Yeni Düzen on 13 March 2011. Translated from Turkish by Tim Drayton. Bora continues as follows: “There is a very deep feeling of powerlessness at the heart of cynicism। The sense of being faced with a force against which objection cannot be brought to bear makes opposition cynical. Cynicism, which opens the way for the loss of the capacity for subjectivity, limits the potential for the ability to act, for activity and mobilisation, or destroys this potential in its entirety.” In short, cynical attitudes pave the way for powerlessness and political incapacity. You proclaim the thing which overwhelms you to be ‘true’. The cynical person looks on political activity and resistance with sarcastic contempt. They think that no result can be obtained. They create through insinuation a ‘truth’ out of the state of incapacity which engulfs them. The cynical person, having lost, together with their will, the potential to be a subject, embraces conformism. This paves the way towards a pragmatism guided by cynicism, i.e. opportunism. We have become acquainted with various examples of cynicism in the course of the ‘crisis’ surrounding the 28 January meeting and in the wake of the 2 March meeting। Certain persons confined themselves to making sarcastic comments; others embellished their sarcasm with opportunism. Neither the Turkish Cypriot community’s existential concerns, fight for identity, struggle for dignity and recognition nor demand for peace - the cynical subject sees none of these. Decontextualising everything and overlooking the sensitivities of the situation, they display ‘merciless scorn for its own sake'. Certain persons count the number of Turkish Cypriots’ cars, some calculate their salaries and others speak of their laziness and their being a ‘kept people’. The finely balanced opportunism, despite careful attempts to camouflage it, eventually moves into the realms of the totally ridiculous। The cynical left-winger now scales the very peaks of Turkish nationalism and declares that the Kurds who abandoned the mountains and presented themselves at the Habur Checkpoint are a ‘disgrace’ to the mothers of the fallen. Since to their minds this will please the authorities more than anything else, they draw a parallel between the Turkish Cypriots and the Kurds in terms of being a ‘disgrace’ to Turkey. That is, the cynic removes the problems experienced by both the Turkish Cypriots and the Kurds from their true context and examines events from within ruling-class nationalist ideology. It is clear that the cynic decontextualises everything and speaks with merciless scorn। Of course, they speak with the authorities in mind. It is apparent that sarcastic disparagement has here reached its zenith. The cynic, guided by their own ‘truth’, either ignores the Turkish Cypriot communty’s realities, or distorts them.The cynic declares everything which does not conform to their own ‘truth’ to be ‘meaningless’. The fact is that the Turkish Cypriot community has become the object of both home-grown and externally grown cynical attitudes. Overcoming this will be no easy matter, but is not entirely impossible. As Tanıl Bora has said, the antidote to cynicism is the development of the capacity to be a subject. “To open a conduit for the potential for the ability to act, to seek out that which may be done and to widen the bounds of that which may be done.” This is what must be done. Παρασέρνει στο πέρασμα του ο χρόνος. Ασυγκίνητα πρόσωπα σ’ ακίνητες πέτρες χαραγμένα. Κ’ ελπίζουν να μην ακούει κανείς. Κλαδιά που φωτίζουν από την αστραπή. στο σπίτι, ανίδεοι, γυμνοί οι πιστοί. Σε φύλλα και κλαδιά ακόμα. Η κοινωνικό-πολιτική ευκαιρία που παρουσιάζεται λόγω των μαζικών κινητοποιήσεων στην άλλη πλευρά, θα έλεγε κάποιος ότι είναι αρκετή από μόνη της για να μας προσηλώσει στην ανάγκη συμπαράταξης με τους Τ/κ και για να δημιουργήσει τις προϋποθέσεις για κοινό μέτωπο δράσης, μέχρι την επανένωση. Από τη μια δεν πτοούμαστε που ακόμα είμαστε λίγοι που βγαίνουμε στους δρόμους. Παρά το συλλαλητήριο της 28ης Ιανουαρίου και το σημερινό, υπάρχουν ακόμα πολλά εμπόδια μπροστά μας στον αγώνα για τη λύση, τα οποία πρέπει να μας προβληματίσουν και να μας ευαισθητοποιήσουν ακόμα περισσότερο. Εμπόδια που συμβάλουν στην αναπαραγωγή αδιαφορίας και διστακτικότητας ανάμεσα σε Ε/κ και που διασπούν το επαναπροσεγγιστικό κίνημα. Στην ε/κ πλευρά επικρατεί η εκλογίκευση του παρόντος στάτους κβο από μερίδα των ΜΜΕ και διάφορων κοινωνικών και πολιτικών παραγόντων, που ενώ δεν εκφράζουν τη λαϊκή βούληση, έχουν στη διάθεση τους υλικούς και χρηματικούς πόρους για να προπαγανδίζουν, εμμέσως πλην σαφώς, εναντίον της λύσης. Αποτέλεσμα αυτού είναι και η θλιβερή μετατόπιση της προσοχής από το όραμα της επανένωσης στις μικρότητες της Τουρκικής διπλωματίας. Έτσι προστέθηκε και το επιχείρημα ότι οι Ε/κ υποκινούν τάχα τους Τ/κ διαδηλωτές. Κάτι που όχι μόνο δεν καθρεφτίζεται στην πραγματικότητα. Κάτι που όχι μόνο διαψεύδεται από τις εσωτερικές τριβές που υπάρχουν εντός της Πλατφόρμας των Τ/κ Συνδικαλιστών, κάτι που όχι μόνο υποβαθμίζει την αγωνιστικότητα των Τ/κ και την ιστορική σημασία της δράσης τους, αλλά και κάτι πάνω στο οποίο βυζαίνουν όσοι ακόμα ασπάζονται το φαντασιακό του διαχωρισμού μεταξύ Τ/κ και Ε/κ. Άλλοι διατυμπανίζουν ότι είναι η τσέπη των Τ/κ που τους οδήγησε στους δρόμους και όχι η έγνοια τους για μια κοινή πατρίδα μαζί μας. Και το χρησιμοποιούν αυτό για να δικαιολογήσουν την απάθειά τους απέναντι στις εξελίξεις. Σίγουρα, υπάρχει και έντονη οικονομική διάσταση στον κοινωνικό αναβρασμό. Όμως οι δηλώσεις των Τ/κ συνδικαλιστών ηγετών, τα πανό, η μαζικότητα των κινητοποιήσεων στην άλλη πλευρά είναι ξεκάθαρη. Όπως είναι ξεκάθαρη και η στήριξη της Πλατφόρμας των Συνδικαλιστικών Οργανώσεων των Τ/κ για την άμεση λύση του Κυπριακού στη βάση των αποφάσεων του ΟΗΕ. Το μήνυμα που πλανάται σήμερα πάνω από την Τ/κ κοινότητα είναι κατ’ εξοχήν πολιτικό και απευθύνεται τόσο προς την Τουρκία όσο και προς την Ε/κ κοινότητα. Ότι ένας νέος συλλογικός βίος μπορεί να ανοιχτεί μπροστά μας, ποιοτικά ανώτερος από τώρα και ασυμβίβαστος με τη λογική της καθυπόταξης στα συμφέροντα των εθνικιστών και της κατοχικής δύναμης της Τουρκίας. Το να παραβλέπεται ότι η παρούσα κατάσταση μπορεί να επιλυθεί με οποιοδήποτε άλλο τρόπο εκτός από τη λύση, θα αποτελούσε στρέβλωση της πολυτάραχης ιστορίας της Κύπρου και προσβολή για όσους αγωνίστηκαν για να την δουν επανενωμένη. Η σημερινή εκδήλωση αγαπητοί φίλοι έχει διπλό σκοπό. Πρώτα απ’ όλα να στείλει μήνυμα αλληλεγγύης στους Τ/κ, υπέρ του αδιαμφισβήτητου δικαιώματός τους για ύπαρξη και διαχείριση της δικής του τύχης. Υπέρ της αντίστασής τους απέναντι στις κατοχικές επιβολές της Τουρκικής κυβέρνησης που σήμερα (ίσως περισσότερο από πριν) φαίνεται ότι πλήττουν τόσο εκείνους όσο και εμάς. Υπέρ του ρόλου που δικαιούνται να έχουν στη χάραξη της πορείας αυτού του τόπου. Ταυτόχρονα, η σημερινή εκδήλωση αποτελεί και επιμονή (έστω εκ μέρους αυτών των λίγων που βρίσκονται εδώ) στην προσπάθεια απεγκλωβισμού από την προπαγάνδα που εμποδίζει τις προσπάθειες για λύση διζωνικής δικοινοτικής ομοσπονδίας, και που δεν επιτρέπει ακόμα σε πολλούς Ε/κ να δουν ότι υπάρχει φως στο τέλος του τούνελ. Ο κοινός μαζικός αγώνας για διαμόρφωση συνείδησης υπέρ της λύσης, διζωνικής δικοινοτικής ομοσπονδίας, υπέρ του δικαιώματος όλων των Κυπρίων να ζήσουν μαζί και να αποβάλουν τα πλασματικά, διαιρετικά στοιχεία που τους κρατούν χωρισμένους, πρέπει επιτέλους να πάρει σάρκα και οστά. Η Πλατφόρμα Ε/Κ και Τ/Κ Εκπαιδευτικών (τμήμα Λάρνακας), χαιρετίζει την πρωινή εκδήλωση διαμαρτυρίας των Αγωνιστών συναδέλφων στο βορρά. Η παρουσία μας εδώ είναι η έμπρακτη μορφή συμπαράστασης στον κοινό αγώνα για την επανένωση του νησιού. Ο κοινός αγώνας, όπως φάνηκε όταν αυτός γινόταν για επιμέρους ζητήματα όπως η διάνοιξη οδοφραγμάτων, απέδειξε ότι, όταν διεξάγεται από κοινού με μαζικούς φορείς, φέρνει αποτελέσματα. Αυτό που επιβάλλεται τώρα είναι η διεύρυνση και η μαζική συμμετοχή σε αυτή τη φάση του κοινού μας αγώνα, που κοινό στόχο έχει τη διζωνική δικοινοτική ομοσπονδία. Σε καμιά περίπτωση δεν πρέπει να αφεθούν οι οι Τ/Κ να σηκώσουν μόνοι το βάρος του αγώνα όπως συνέβη το 2004 και πριν. Αυτό το ιστορικό λάθος από τη δική μας πλευρά δεν πρέπει να επαναληφθεί. Η παρουσία μας εδώ λοιπόν, σηματοδοτεί αυτή την πραγματικότητα και συνάμα καθορίζει την πρόθεσή μας να πορευτούμε μαζί με τους αγωνιστές συναδέλφους του βορρά. Η δύναμη του δικοινοτικού κινήματος και η υλοποίηση στόχων που τέθηκαν δείχνουν ποιο δρόμο πρέπει να ακολουθήσουμε. Τον ίδιο δρόμο μας δείχνει και η αποφασιστικότητα των συναδέλφων Τ/Κ. Καλούμε λοιπόν όλους τους εκπαιδευτικούς, τουλάχιστον όσους τρέφουν αγάπη για την Κύπρο, να ορθώσουν το ανάστημά τους και να δράσουν με αποφασιστικότητα στα πλαίσια του αγώνα για επανένωση. Καλούμε τους συναδέλφους, ιδιαίτερα στη Λάρνακα, που τελευταία στοχοποιήθηκε από τους θιασώτες της μη λύσης και του μόνιμου διαχωρισμού και από τις δυνάμεις που προωθούν το ρατσισμό και τον εθνικισμό, να αντιπαλέψουν αυτή την τάση, έτσι ώστε να δημιουργηθούν καλύτερες συνθήκες που να ευνοούν την πορεία προς τη λύση της διζωνικής δικοινοτικής ομοσπονδίας. Καλούμε τους εκπαιδευτικούς, όπου κι αν βρίσκονται, να πιέζουν τις ηγεσίες για λύση μέσα στο 2011. Να συμβάλουμε αποφασιστικά στη λείανση του εδάφους για λύση μέσα από την προσέγγιση και την καθημερινή επαφή. Η άσχημη οικονομική κατάσταση στο βορρά και η οικονομική κρίση στο νότο θα βρουν τη μόνιμη τους λύση μέσα στις συνθήκες που θα φέρει η λύση και η επανένωση του νησιού. Αυτό πρέπει να γίνει συνείδηση σε όλους. Σενέρ Ελτζίλ: "Το μήνυμα των Τ/Κ στην Άγκυρα είναι ξεκάθαρο: Το παιχνίδι τελείωσε. Σεβαστείτε τους Κυπρίους που θέλουν λύση και επανένωση"
"Το μήνυμα των Τ/Κ στην Άγκυρα είναι ξεκάθαρο: Το παιχνίδι τελείωσε. Σεβαστείτε τους Κυπρίους που θέλουν λύση και επανένωση"
Στις Βρυξέλλες μεταβαίνει στα τέλη Μαρτίου αντιπροσωπεία της τ/κ Συνδικαλιστικής Πλατφόρμας για την πραγματοποίηση συμβολικής κινητοποίησης έξω από το Ευρωπαϊκό Κοινοβούλιο. Στόχος της κινητοποίησης και των επαφών με αξιωματούχους της ΕΕ, θα είναι να γνωρίσουν από πρώτο χέρι τις πραγματικότητες στα κατεχόμενα, υπογραμμίζει σε συνέντευξή του στη «Χαραυγή» ο γενικός γραμματέας της Συντεχνίας Τ/κ Δασκάλων (KTOS) Σενέρ Ελτσίλ. «Το παιχνίδι τέλειωσε» για την Τουρκία τονίζει ο Τ/κ συνδικαλιστής διαμηνύοντας ότι η ψευδοκυβέρνηση δεν εκπροσωπεί τους Τ/κ, κάτι που αποδεικνύεται από τις χιλιάδες που μαζεύτηκαν στην κατεχόμενη Λευκωσία την περασμένη Τετάρτη στέλνοντας το ξεκάθαρο μήνυμα προς την Άγκυρα ότι θέλουν λύση και ομοσπονδιακή επανένωση για να μην είναι δούλοι και όμηροι της Άγκυρας. «Θέλουμε να διοικούμε τους εαυτούς μας», «δεν θέλουμε την επιβολή του τουρκικού οικονομικού πακέτου», προσθέτει ο Σ. Ελτσίλ. Τονίζει παράλληλα ότι μετά την εκπνοή του τελεσίγραφου προς την ψευδοκυβέρνηση για παραίτηση ή απόσυρση του πακέτου στις 25 Μαρτίου, το επόμενο συλλαλητήριο θα μεταφερθεί από την πλατεία Ινονού στο δρόμο όπου βρίσκεται η ψευδοβουλή και η λεγόμενη «πρεσβεία» της Τουρκίας στα κατεχόμενα. Το πρόσφατο συλλαλητήριο της περασμένης Τετάρτης ήταν μια πάρα πολύ πετυχημένη εκδήλωση που οργανώθηκε για να διαμηνύσουμε ότι οι Τ/κ θέλουν λύση και επανένωση, θέλουν μια και μοναδική ομοσπονδιακή ενωμένη Κύπρο. Αυτός ήταν ο ένας κύριος στόχος ενώ ο άλλος ήταν το αίτημα των Τ/κ να διοικούν τους εαυτούς τους. Δεν γίνεται να είμαστε δούλοι ή όμηροι της Τουρκίας. Ήταν ένα δυνατό μήνυμα. Κατορθώσαμε να μαζέψουμε στην πλατεία Ινονού περίπου 78 χιλιάδες άτομα. Πρόκειται για τη μεγαλύτερη συγκέντρωση πλήθους στην ιστορία μας. Ήταν πολύ πετυχημένο το συλλαλητήριο που διοργάνωσε η Συνδικαλιστική Πλατφόρμα. Πρέπει να πω ότι πέραν από τα 28 μέλη της Πλατφόρμας, είχαμε και την υποστήριξη συντεχνιών εκτός της Πλατφόρμας. 44 συνδικαλιστικές οργανώσεις στο σύνολο και έξι πολιτικά κόμματα υποστήριξαν αυτή την προσπάθεια. Το μήνυμα προς την Τουρκία ήταν ξεκάθαρο και ο στόχος του συλλαλητηρίου ήταν να στείλουμε ηχηρό μήνυμα στην Άγκυρα. Είμαστε αντίθετοι στις ενέργειες της Τουρκίας στο βόρειο μέρος της Κύπρου. Αρκετά. Το παιχνίδι τέλειωσε (Game Over). Την ίδια μέρα με το συλλαλητήριό μας, η «κυβέρνηση» μαριονέτα εδώ είχε συνεδρία και ανακοίνωσε ότι επιμένει να προτείνει διάλογο για βελτίωση του «πακέτου λιτότητας». Στην πραγματικότητα δεν είναι όμως ένα «πακέτο λιτότητας». Είναι ένα πακέτο επιβολής της Τουρκίας. Πήραν διαταγή από την Άγκυρα να επιβάλουν αυτό το πακέτο στους Τ/κ και επιμένουν ότι έχουν υποστήριξη. Αυτό δεν ανταποκρίνεται στην αλήθεια. Εάν κατορθώσαμε να μαζέψουμε τόσο κόσμο στην πλατεία Ινονού, λαμβάνοντας υπόψιν όλους αυτούς που λόγω προβλημάτων δεν βρίσκονταν εκεί, σημαίνει ότι όλη η τ/κ κοινότητα ήταν μαζί μας. Μας υποστήριξε και είναι κάτι που δείχνει ότι η «κυβέρνηση» του Κόμματος Εθνικής Ενότητας έχασε τα ερείσματά της εντός των Τ/κ. Σχεδόν όλη η τ/κ κοινότητα μάς υποστηρίζει, με εξαίρεση κάποιες ακροδεξιές οργανώσεις. Δεν είναι τίποτα αυτοί. Ακόμη και ο Ραούφ Ντενκτάς δήλωσε ότι θα συμμετείχε στο συλλαλητήριο, αλλά δεν το έπραξε γιατί φοβόταν ότι θα υπήρχαν συγκρούσεις… Στην πραγματικότητα δεν θέλουμε τον Ραούφ Ντενκτάς. Δεν συμφωνούμε μαζί του. Οι αντιλήψεις του και η ιδεολογία του είναι υπεύθυνη για τα όσα υποφέρουμε σήμερα. Ακόμη ο πατέρας Ντενκτάς δήλωσε ότι το συλλαλητήριο έδειξε ότι οι Τ/κ δεν είναι εχθροί με τους απλούς Τούρκους, αλλά έχουν πρόβλημα με την τουρκική κυβέρνηση. Εμείς όμως πάντοτε λέγαμε και λέμε και το είχαμε ως πανό στο συλλαλητήριο ότι όλοι οι λαοί είναι φίλοι μας. Όχι μόνο ο τουρκικός λαός. Και ο ελληνικός και ο αγγλικός λαός δεν είναι εχθροί μας, ούτε εχθροί μεταξύ τους. Όλοι οι λαοί είναι αδέρφια. Αυτό πιστεύουμε και το πρόβλημά μας είναι με τους καπιταλιστές κρατούντες στην Τουρκία και σε πολλές χώρες στην Ευρώπη. Είμαστε ενάντια στην πολιτική της Τουρκίας, όχι ενάντια στον απλό άνθρωπο στους δρόμους της Τουρκίας. Αυτό για μας είναι ξεκάθαρο, δεν χρειαζόταν να το επισημάνει ο Ραούφ Ντενκτάς. Ξέρουμε τι θέλουμε. Η Τουρκία προσπαθεί να επιβάλει καταστάσεις επί των Τ/κ και εμείς διαδηλώνουμε. Διερωτόμαστε τι μένει να κάνουμε. Στο άμεσο μέλλον, περί τα τέλη Μαρτίου, πιθανότατα από τις 21 μέχρι τις 25 Μαρτίου, αποφασίσαμε ως Συνδικαλιστική Πλατφόρμα να μεταβούμε στις Βρυξέλλες. Μια συμβολική αντιπροσωπεία Τ/κ συνδικαλιστών θα διαμαρτυρηθεί ενάντια στην Τουρκία έξω από το Ευρωπαϊκό Κοινοβούλιο. Θα έχουμε επίσης επαφές με αξιωματούχους της ΕΕ και ηγέτες πολιτικών ομάδων στην Ευρωβουλή. Στόχος αυτής της κινητοποίησης και των επαφών μας θα είναι να τους εξηγήσουμε τι ακριβώς συμβαίνει στην Κύπρο και γιατί διαδηλώνουν οι Τ/κ. Ο λόγος που επιβάλλεται να το κάνουμε αυτό είναι γιατί δεν γνωρίζουν οι Ευρωπαίοι από πρώτο χέρι την κατάσταση των Τ/κ. Η λεγόμενη κυβέρνηση εδώ και ο Ντερβίς Ερογλου δεν αντιπροσωπεύουν τους Τ/κ, δεν μας εκπροσωπούν. Εκπροσωπούν τα συμφέροντα και υπερασπίζονται τα οφέλη της Τουρκίας αντί της τ/κ κοινότητας. Αυτές είναι οι πραγματικότητες για την κατάσταση των Τ/κ στην Κύπρο και αυτά θα παρουσιάσουμε στους Ευρωπαίους. Χρειαζόμαστε διεθνή αλληλεγγύη και υποστήριξη. Ευρωπαϊκές και διεθνείς συνδικαλιστικές οργανώσεις μάς υποστηρίζουν, αλλά θα οργανώσουμε την επίσκεψη και τη δράση μας στις Βρυξέλλες από μόνοι μας. Έχουμε δώσει τελεσίγραφο στη λεγόμενη κυβέρνηση μέχρι τις 25 Μαρτίου. Τους έχουμε δώσει δύο επιλογές, είτε να παραιτηθούν είτε να ανακοινώσουν ότι δεν θέλουν να επιβάλουν το πακέτο. Εάν δεν παραιτηθούν και εάν δεν αποσύρουν το πακέτο που επιβάλλει η Τουρκία θα προχωρήσουμε σε μια σειρά πολλών κινητοποιήσεων και δραστηριοτήτων. Έχουμε την υποστήριξη του κόσμου και όσο περνά ο καιρός μάς υποστηρίζουν όλο και περισσότεροι Τ/κ. Είμαστε πολύ δυνατοί. Τόσες χιλιάδες από την τ/κ κοινότητα μάς υποστηρίζουν στον αγώνα μας. Μετά τις 25 Μαρτίου, το νέο ενδεχόμενο συλλαλητήριο δεν θα γίνει στην πλατεία Ινονού. Θα μεταφερθούμε στο δρόμο της «βουλής» και της «πρεσβείας» της Τουρκίας. Εκεί θα γίνει η επόμενη μαζική κινητοποίησή μας εάν η «κυβέρνηση» δεν ανταποκριθεί στο χρόνο που της δώσαμε. Δεν μας ενδιαφέρει εάν επιχειρήσουν να κλείσουν το δρόμο. Οι δρόμοι ανήκουν στον κόσμο, όχι στον τουρκικό στρατό και την «πρεσβεία». Δεν θα κάνουν ότι θέλουν πλέον. Έχουμε αναστείλει απλά τις απεργίες στα σχολεία. Οι απεργίες στα «δικαστήρια» και στο «τελωνείο» συνεχίζονται. Είναι αποφάσεις τακτικής για τους εργαζόμενους. Για παράδειγμα εμείς δεν θέλουμε να χάνουμε χρόνο, ενέργεια και να έχουμε επιπλέον οικονομικό κόστος για την υποστήριξη των απεργών και θέλουμε να ρίξουμε το βάρος μας στις κινητοποιήσεις μας. Αυτή τη φορά δεν ήταν τόσο έντονη η αντίδραση της Τουρκίας. Ο Τούρκος Υπουργός Εξωτερικών, ο κ. Νταβούτογλου, είπε ότι υπάρχει «δημοκρατία» στο βόρειο μέρος της Κύπρου και μπορούν να κάνουν διαδηλώσεις, αλλά αυτές να μην στρέφονται ενάντια στην Τουρκία. Όμως είναι ξεκάθαρο ότι εμείς διοργανώνουμε τα συλλαλητήρια και τις διαδηλώσεις ενάντια ακριβώς στην Τουρκία. Όμως δεν θέλουν να δουν την πραγματικότητα. Επιχειρούν να αποκρύψουν την πραγματικότητα, όχι μόνο για εσωτερική χρήση προς τον τουρκικό λαό, αλλά και για να κρύψουν τις πραγματικότητες στο βορρά και από τη διεθνή κοινότητα. Ο αγώνας μας είναι ξεκάθαρος και θα συνεχίσουμε να αγωνιζόμαστε για τα δικαιώματά μας. Και ο κ. Μπαγίς δήλωσε ότι τα παιδιά δεν πρέπει να αντιμιλούν στους γονείς τους, αναφερόμενος στην Τουρκία ως «μητέρα πατρίδα» των Τ/κ. Ο κ. Μπαγίς πρέπει να γνωρίζει ότι οι Τ/κ δεν είναι παιδιά του. Είμαστε αδέρφια του. Όμως είμαστε αδέρφια και με τους Ε/κ συμπατριώτες μας, είμαστε αδέρφια και με τον ελληνικό, τον τουρκικό και τον αγγλικό λαό. Με όλους τους λαούς. Δεν είμαστε παιδιά κανενός, συμπεριλαμβανομένης της Τουρκίας. Πρέπει να μας σεβαστούν. Τέτοιες δηλώσεις και αντιλήψεις είναι εξευτελιστικές για τους Τ/κ. Η Τουρκία παραμένει στην Κύπρο υπό τη δικαιολογία των εγγυητικών δικαιωμάτων της. Τα εγγυητικά δικαιώματα όμως μιλούν για διατήρηση της ενότητας της Κύπρου και της συνταγματικότητας. Η Τουρκία δεν μπορεί να βρίσκεται εδώ για να μεταφέρει πληθυσμό για να αλλοιώσει δημογραφικά τον πληθυσμό. Ούτε για να διανέμει τις ε/κ περιουσίες στους έποικους από την Τουρκία. Ούτε για να παραχωρεί «υπηκοότητες» της «ΤΔΒΚ». Ούτε για τη δημιουργία ενός ψευδοκράτους ή καθεστώτος εδώ. Ούτε για να κρατεί αιχμάλωτη τη βούληση των Τ/κ. Η Τουρκία οφείλει να σεβαστεί όλες τις διεθνείς συνθήκες και συμφωνίες και να σεβαστεί τόσο τους Τ/κ όσο και τους Ε/κ. Αυτό το νησί ανήκει στους Κυπρίους. Πρέπει να το σεβαστούν αυτό και εμείς τους στέλνουμε αυτό το ξεκάθαρο μήνυμα. Είναι η γνωστή κακόγουστη προπαγάνδα τους. Πιστεύω ότι τα ίδια αντιμετωπίζουν οι προοδευτικοί Ε/κ στη δική σας πλευρά. Οι πατριώτες που αγαπούν τη χώρα τους χαρακτηρίζονται και στην ε/κ κοινότητα, «ελληνόφωνες Τούρκοι». Έχουν παρόμοια ιδεολογία και παρόμοιες κατηγορίες. Για αυτό είναι φασίστες και ρατσιστές. Εδώ έχουμε αρκετούς και στην ε/κ κοινότητα έχετε παρόμοιες καταστάσεις. Πιστεύω θα ήταν καλύτερα να τους παραχωρήσουμε ένα γήπεδο ποδοσφαίρου και να τους αφήσουμε να «μοιραστούν» τον εθνικισμό και τους καβγάδες τους. Εκμεταλλεύονται το αίμα, τα δάκρυα και τον πόνο των ανθρώπων για την προπαγάνδα τους και στρέφονται ενάντια των πατριωτικών δυνάμεων και στις δύο κοινότητες. Αρκετά υποφέραμε από τη δράση τους. Φτάνει πια. Λένε πολλά για μένα και για άλλους προοδευτικούς Τ/κ. Δεν με ενδιαφέρει θα συνεχίσουμε να παλεύουμε για την πατρίδα μας. Συνέντευξη της Πλατφόρμας στον "Πολίτη"
Απαντήσεις δίνουν δύο ενεργά μέλη της Πλατφόρμας Ε/Κ και Τ/Κ Εκπαιδευτικών «Ενωμένη Κύπρος». Ο Γιώργος Χαραλάμπους και ο Γρηγόρης Ιωάννου. Είναι εκπαιδευτικοί κι εργάζονται στην τριτοβάθμια εκπαίδευση. Η Πλατφόρμα ιδρύθηκε τον Νοέμβριο του 2004 και σε αυτήν συμμετέχουν Ε/Κ και Τ/Κ εκπαιδευτικοί. Στο τουρκοκυπριακό τμήμα της πλατφόρμας συμμετέχουν επίσημα τα συνδικάτα των εκπαιδευτικών, ενώ στο ελληνοκυπριακό τμήμα η πρωτοβουλία στηρίζεται σε μια ομάδα δραστήριων εκπαιδευτικών. Είναι αυτοί που διοργανώνουν τις εκδηλώσεις. Γρηγόρης: Τ/Κ και Ε/Κ εκπαιδευτικοί συνεργαζόμαστε στενά και προσπαθούμε να κάνουμε κοινές εκδηλώσεις και στις δύο πλευρές. Ως ελληνοκυπριακό τμήμα της Πλατφόρμας, κινούμαστε σε δύο άξονες: Ο πρώτος είναι ο αγώνας για τη λύση, ασκώντας πιέσεις στις κυβερνήσεις ώστε να προχωρήσουν σε συμφωνία που θα επανενώσει τη χώρα μας. Και ο δεύτερος είναι ο αγώνας κατά του εθνικισμού, κυρίαρχος στην παιδεία ειδικά στην ελληνοκυπριακή κοινότητα, στο εκπαιδευτικό σύστημα. Εκδίδουμε επίσης από το 2008 το «Καλέμι», έντυπο που κυκλοφορεί από χέρι σε χέρι ανάμεσα στους καθηγητές όπου παρουσιάζονται οι δράσεις της Πλατφόρμας και αναλύονται εκπαιδευτικά ζητήματα. Όπως για παράδειγμα, η προσπάθεια της Κυβέρνησης για τη μεταρρύθμιση, την οποία εμείς στηρίξαμε κι απογοητευτήκαμε που δεν προχώρησε στο βαθμό που θα θέλαμε, ειδικά στο μάθημα της ιστορίας. Πριν δυο περίπου χρόνια δημιουργήσαμε κι ένα μπλογκ. Η Πλατφόρμα είναι ένας ζωντανός οργανισμός, που επικοινωνεί σε τακτική βάση, μιλούμε, γράφουμε και οργανώνουμε κοινές εκδηλώσεις και συνέδρια. Γρηγόρης: Κατ΄ αρχή πρέπει να αφαιρεθούν οι εθνικιστικές στρεβλώσεις από την παιδεία. Και στην ε/κ κοινότητα και στην τ/κ. Στην τ/κ κοινότητα φαίνεται ότι γίνεται μεγαλύτερη πρόοδος. Ακόμα και τα βιβλία της ιστορίας άλλαξαν το 2004, όταν ανέβηκε στην εξουσία ο Ταλάτ. Βέβαια, όταν εξελέγη ο Έρογλου τα άλλαξε ξανά, βάζοντας κάποια εθνικιστικά στοιχεία μέσα, όμως η διαφορά μεταξύ των δύο κοινοτήτων είναι πως στην τ/κ υπάρχουν πάρα πολλοί εκπαιδευτικοί που στηρίζουν σταθερά την ειρήνη, την επανένωση και είναι κόντρα στον εθνικισμό. Αυτοί αντιπροσωπεύουν μια τεράστια μερίδα των Τ/Κ δασκάλων και καθηγητών. Οπόταν και εθνικιστικά βιβλία να υπάρχουν, όταν ο δάσκαλος δεν είναι εθνικιστής το μάθημα μπορεί να διαμορφώσει παιδεία. Στην ε/κ κοινότητα έχουμε ένα ζήτημα και θα το πω έξω από τα δόντια. Θεωρώ ότι μια μεγάλη μερίδα Ε/Κ εκπαιδευτικών εκφράζονται με εθνικιστικό τρόπο. Θα θυμάστε την ανακοίνωση της ΟΕΛΜΕΚ παλαιότερα εναντίον του υπ. Παιδείας, ζητώντας να αποκαταστήσει τη σωστή εκδοχή της ιστορίας. Ή η ηγεσία της ΠΟΕΔ όπου έβγαλε μια ανακοίνωση με την οποία έλεγε ότι κάνει κακό η επαφή των Ε/Κ μαθητών δημοτικού με τους Τ/Κ συνομήλικούς τους. Γιώργος: Δεν έχω πλέον την άμεση εμπειρία της δημοτικής εκπαίδευσης, αλλά από τις εμπειρίες μου, τις ανακοινώσεις, τα όσα ακούμε γενικότερα, θεωρώ ότι οι εθνικιστικές στρεβλώσεις υπάρχουν. Μπορεί κάποια συνθήματα να είναι πιο μαλακά ή πιο έμμεσα πια, αλλά θεωρώ ότι η ελληνοκυπριακή παιδεία υπερτονίζει το ελληνικό στοιχείο. Μπολιάζουμε στα παιδιά μόνο τον πόνο από το θλιβερό παρελθόν και το μέλλον το αφήνουμε να επικρέμαται σαν σύνθημα. Γιώργος: Γενικότερα οι ιστορικές αναδρομές που γίνονται μέσα στα πλαίσια της κυπριακής εκπαίδευσης, ουσιαστικά θυματοποιούν περισσότερο τους Ε/Κ. Αυτό δεν σημαίνει ότι πρέπει να επισκιάζεται η κατοχή, ο ρόλος του ιμπεριαλισμού και της Τουρκίας. Αλλά μέσα στα πλαίσια της τοπικής διάστασης του κυπριακού προβλήματος, η ε/κ παιδεία και η εκπαίδευση είναι ετεροβαρής και τείνουν προς τη θυματοποίηση των Ε/Κ και πολύ λιγότερο των Τ/Κ. Αυτό είναι ιστορική στρέβλωση και δεν επιτρέπει τη διαμόρφωση κουλτούρας λύσης. Γρηγόρης: Υπάρχει αυτό το μονοπώλιο του πόνου. Λες και δεν υπάρχουν Τ/Κ αγνοούμενοι και πρόσφυγες, ή λες κι ο πόλεμος δεν έφερε κακό σε ολόκληρο τον πληθυσμό της χώρας. Αυτή η αντίληψη παραμένει η ίδια εδώ και δεκαετίες. Μπορεί από τότε να άνοιξαν τα οδοφράγματα να αυξηθήκαν στο ελάχιστο οι αναφορές στην τ/κ κοινότητα, αλλά επί της ουσίας υπάρχει μια θέση ότι, ένα περίπου, η Κύπρος είναι η ε/κ κοινότητα. Συνεπώς δεν πρέπει να αναρωτιόμαστε γιατί δεν βγήκαν άλλοι να εκφράσουν συμπαράσταση στον αγώνα των Τουρκοκυπρίων. Γιώργος: Αυτή η νοοτροπία δεν επιτρέπει σε πολύ κόσμο να ξεπεράσει φοβίες, να βγει στους δρόμους, να μιλήσει για αλληλεγγύη και να περάσει μήνυμα συμπαράταξης. Υπήρξε πρόοδος. Όταν ήμασταν εμείς μαθητές κυκλοφορούσαν φυλλάδια, ειδικά σε περιόδους εθνικών εορτών, που έγραφαν «καλός Τούρκος, νεκρός Τούρκος». Αυτές πλέον δεν είναι τόσο διαδεδομένες μέθοδοι εθνικιστικής συνείδησης. Όμως υπάρχει αυτή η επικέντρωση στη θυματοποίηση των Ε/Κ και μόνο. Την τελευταία δεκαετία πάρα πολλοί ακαδημαϊκοί, ανεξαρτήτως πολιτικού χώρου, ανέδειξαν το ζήτημα στην ε/κ παιδεία. Το λυπηρό είναι πως αυτά τα επιστημονικά πορίσματα δεν έχουν την ανάλογη προβολή στην κυπριακή πραγματικότητα. Γρηγόρης: Αυτή η γνώση επειδή συγκρούεται με εθνικιστικά ιδεολογήματα του παρελθόντος, δεν καταφέρνει να περάσει στην εκπαίδευση. Μα η Ακαδημία και το Πανεπιστήμιο πρέπει ουσιαστικά να επικοινωνούν με την κοινωνία και την Παιδεία! Δεν γίνεται να χρησιμοποιούνται ακόμη τα εγχειρίδια και οι προσεγγίσεις του ΄60 και του ΄70. Τα οποία εμπεδώνουν το φόβο στα παιδιά. Γρηγόρης: Ναι. Μια φορά έγινε επίσκεψη σε σχολείο και ήταν με την έγκριση των γονιών. Ήταν μη εργάσιμη μέρα του σχολείου. Το 2008. Όμως εμείς ως εκπαιδευτικοί κάνουμε συχνά επισκέψεις σε σχολεία τουρκοκυπριακά. Με τους μαθητές είναι πιο δύσκολο γιατί υπάρχει αντίδραση από πλευράς των ελληνοκυπριακών εκπαιδευτικών οργανώσεων. Γιώργος: Χρειάζεται περισσότερη κινητικότητα σε κοινωνικό επίπεδο, από την οποία να τροφοδοτείται και η πολιτική ηγεσία η οποία διαπραγματεύεται. Γρηγόρης: Δεν θα έλεγα ότι είναι ανύπαρκτη. Υπάρχει όμως μια γενικευμένη αδιαφορία εκ μέρους των Ε/Κ. Δεν είναι μόνο η Κοινωνία των Πολιτών αδύνατη. Είναι και τα ίδια τα κόμματα ως μηχανισμοί αδύναμοι. Γιώργος: Η Κοινωνία των Πολιτών είναι πιο πλούσια από προηγουμένως, αλλά -και αυτό το αλλά έχει τεράστια σημασία- είναι πιο πλούσια σε τμηματικά συμφέροντα κι όχι σε ιδεώδη όπως το ιδεώδες της λύσης. Γρηγόρης: Έγιναν κάποιες συναντήσεις, βγήκαν κάποιες ανακοινώσεις, όμως δεν πιστεύω πως είναι τυχαίο που βρέθηκε η Πλατφόρμα να κάνει εκδηλώσεις. Είμαστε έντονα δραστήριοι εδώ κι αρκετά χρόνια, κι είχαμε και το θάρρος να βγούμε στο δρόμο. Γιώργος: Η προπαγάνδα εναντίον της λύσης, η οποία πολλές φορές μπορεί να είναι έμμεση αλλά κάνει τη δουλειά της, είναι ένας από αυτούς τους λόγους. 'Αλλος λόγος είναι ότι μερίδα των ΜΜΕ, ίσως η πλειοψηφία των ΜΜΕ, στηρίζει τις εθνικιστικές δυνάμεις. Γρηγόρης: Στα τηλεοπτικά Μέσα είναι συντριπτική η νίκη του εθνικισμού. Κι όταν έχεις ταυτόχρονα μια παιδεία εθνικιστική, μια εκκλησία με τεράστια οικονομική και πολιτική εξουσία η οποία έχει εθνικιστική ηγεσία -τις προάλλες θα θυμάστε την εκστρατεία που έκανε μοιράζοντας φυλλάδια- αντιλαμβάνεστε ότι υπάρχει ένας μηχανισμός προπαγάνδας που έχει σκοπό να εμποδίσει τη λύση του Κυπριακού. Κι αυτός ο μηχανισμός δεν είναι το ΕΛΑΜ. Το ΕΛΑΜ είναι η ακροδεξιά συνιστώστασα αυτής της κατάστασης. Οι δυνάμεις που εναντιώνονται στην επανένωση της χώρας είναι σοβαρές μέσα στην κοινωνία. Και μέσα στα κόμματα, υπάρχουν σοβαρές δυνάμεις προς τον εθνικισμό. Γρηγόρης: Το βασικό ζήτημα, πέραν από τις δυνάμεις του απορριπτισμού που είναι δυνατές με πολλά λεφτά κι εξουσία, με διασυνδέσεις με το κράτος, είναι η απογοήτευση του κόσμου. Το 2004 επέφερε τραγικό πλήγμα στην επαναπροσέγγιση η οποία υπήρχε δυνατά από το ΄90 και κορυφώθηκε και μαζικοποιήθηκε το 2003 με το άνοιγμα των οδοφραγμάτων. Το πέρασμα στην αντίθετη πλευρά μετά το 2004 σταμάτησε. Υπάρχει μια σημαντική μειοψηφία του 10 -15% που συνεχίζει να διασταυρώνει τα οδοφράγματα, και να έχει επαφές με την άλλη πλευρά, αλλά δεν μπορεί να συγκριθεί τούτο με το βαθμό που υπάρχει στην τ/κ κοινότητα. Γρηγόρης: Ναι, αν κι αυτή τη φορά δεν καταφέρνει η ε/κ κοινότητα να αφουγκραστεί το τι γίνεται και να δράσει, θα είναι πιο καθοριστική η ήττα σε σχέση με εκείνη που υπέστη το κίνημα της λύσης και της επανένωσης το 2004. Γιώργος: Ταυτόχρονα καταβάλλονται και προσπάθειες για λύση σε πολιτικό επίπεδο. Προσωπικά πιστεύω ότι η παρούσα Κυβέρνηση κάνει ουσιαστικές προσπάθειες και πρέπει να υποστηριχθεί στην προσπάθειά της για λύση. Όμως το κοινωνικό επίπεδο είναι πάρα πολύ σημαντικό και ίσως μια αποτυχία να ενώσουμε τις φωνές μας με τους Τ/Κ, να μεταφραστεί και σε αποτυχία στο πολιτικό. Γιώργος: Μέσα από τις κινητοποιήσεις βγαίνει άλλο ένα δυνατό μήνυμα. Ότι έχουμε και οι δυο κοινότητες ακόμη έναν κοινό εχθρό εκτός από τον εθνικισμό. Την Τουρκία. Και είναι άλλο ένα σημείο που μας ενώνει. Που μπορεί να χρησιμοποιηθεί και ως πολιτικό επιχείρημα στους διστακτικούς της επανένωσης. Πρόσφατα έχουν δει το φως της δημοσιότητας διάφορα κείμενα που επιδιώκουν να αναλύσουν τη σημασία των Τουρκοκυπριακών κινητοποιήσεων. Ένα κεντρικό ερώτημα των αναλύσεων αυτών είναι αν αυτές οι κινητοποιήσεις έχουν οποιοδήποτε αντίκτυπο στην επιθυμία των Τ/Κ για επίλυση του Κυπριακού ή αν συνδέονται με αλλαγή αντιλήψεων σχετικά με την ποιότητα των διακοινοτικών σχέσεων απέναντι στους Ε/Κ . Δυστυχώς οι αναλύσεις αυτές είναι περισσότερο πολιτικές και δεν στηρίζονται σε οποιαδήποτε ερευνητική τεκμηρίωση. Στο σύντομο αυτό άρθρο θα επιδιώξω μια χαρτογράφηση της ποιότητας των διακοινοτικών σχέσεων και στις δύο κοινότητες από την περίοδο των προηγούμενων κινητοποιήσεων των Τ/Κ μέχρι σήμερα, βασιζόμενος σε ποσοτικές και ποιοτικές κοινωνιοψυχολογικές έρευνες που είχα την ευκαιρία να συντονίσω με συλλογή δεδομένων και από τις δυο κοινότητες. Οι μαζικές κινητοποιήσεις της πλειοψηφίας των Τ/Κ πριν το δημοψήφισμα του 2004 έγιναν με σύνθημα την ένταξη στην Ευρωπαϊκή Ένωση μέσα από ένα άνοιγμα προς την Ε/Κ κοινότητα για συνεργασία στα πλαίσια λύσης Διζωνικής-Δικοινοτικής Ομοσπονδίας. Το δημοψήφισμα μπορεί να χαρακτηριστεί σημείο καμπής στην πρόσφατη ιστορία του Κυπριακού και το αποτέλεσμα του δημοψηφίσματος είχε δραματικές επιπτώσεις στην ποιότητα των διακοινοτικών σχέσεων όπως αυτές μπορούν να καταγραφούν από τα επίπεδα εμπιστοσύνης, στάσεις και επιθυμία για συμβίωση μεταξύ των δύο κοινοτήτων. Σε ποιοτική έρευνα εστιασμένων συζητήσεων και ποσοτική έρευνα με αντιπροσωπευτικό δείγμα 800 Ε/Κ και 853 Τ/Κ το 2007, τρία χρόνια μετά το δημοψήφισμα, καταγραφόταν μια μεγάλη δυσπιστία μεταξύ των μελών των δύο κοινοτήτων και στροφή μακριά από την συμβιβαστική λύση της Διζωνικής-Δικοινοτικής Ομοσπονδίας προς μαξιμαλιστικές θέσεις. Στην μεν Ε/Κ κοινότητα υπήρξε μια ενδυνάμωση της επιδίωξης του Ενιαίου κράτους, δηλαδή κάποιου τύπου επιστροφή στις συμφωνίες του 1960 ως την λύση του Κυπριακού προβλήματος ενώ στην Τ/Κ κοινότητα υπήρξε μια αντίθετη στροφή προς την λύση των δύο κρατών, κυρίως ως έκφραση της απογοήτευσης των Τ/Κ για το Ελληνοκυπριακό ‘όχι’ στο δημοψήφισμα το οποίο εισέπραξαν σαν απόρριψη, σαν επιθυμία των Ε/Κ για μη λύση, σαν δείγμα απουσίας επιθυμίας για διαμοιρασμό της εξουσίας ενός διεθνώς αναγνωρισμένου κράτους, και σε πολλές περιπτώσεις ένα αίσθημα ότι οι Ε/Κ ‘τα θέλουν όλα δικά τους’. Στο επίπεδο των συλλογικών ταυτοτήτων παρουσιαζόταν ήδη μια ισχυρή τάση ενός κοινοτικού νέο-εθνικισμού και στις δύο κοινότητες με κύριο χαρακτηριστικό τις αυτονομιστικές τάσεις και από τις ‘μητέρες πατρίδες’ αλλά και από την άλλη κοινότητα. Η αλλαγή ηγεσίας στην Ε/Κ κοινότητα το 2008 και η γρήγορη πρόοδος στη διάνοιξη του οδοφράγματος της οδού Λήδρας είχε δημιουργήσει προς στιγμή προσδοκίες αντιστροφής του κλίματος αυτού στο επίπεδο των διακοινοτικών σχέσεων στην Ε/Κ κοινότητα αλλά στο βαθμό που οι συνομιλίες δεν προχώρησαν με τον αναμενόμενο ρυθμό η απογοήτευση γρήγορά επικράτησε και πάλι. Αντίθετα μέσα στην Τ/Κ κοινότητα η αλλαγή ηγεσίας στην Ε/Κ κοινότητα αποδεικνύεται ότι είχε σημαντική επίδραση στην ποιότητα των διακοινοτικών σχέσεων προς τους Ε/Κ αφού μια σύγκριση των αποτελεσμάτων έρευνας του 2007 και 2010 δείχνει σημαντική βελτίωση σε μια σειρά από μεταβλητές. Συγκεκριμένα, παρατηρείται σημαντική βελτίωση της στάσης και εμπιστοσύνης των Τ/Κ απέναντι στους Ε/Κ ενώ ο Τουρκοκεντρισμός των Τ/Κ σημειώνει σημαντική πτώση. Ενδεικτικό της βελτίωσης των διακοινοτικών σχέσεων είναι ότι το 2007 ένα 25% των Τ/Κ δήλωνε ότι έχει τουλάχιστον ένα Ε/Κ φίλο, ενώ το 2010 το ποσοστό αυτό ανεβαίνει στο 35%. Ακόμη πιο σημαντικό είναι το γεγονός ότι οι θετικότερες στάσεις μεταφράζονται και σε θετικότερες αντιλήψεις για τον επιδιωκόμενο τρόπο επίλυσης του Κυπριακού. Χαρακτηριστικά αναφέρεται ότι όταν τους ζητήθηκε να καταδείξουν την καλύτερη μόνιμη λύση στο Κυπριακό, από 68% που προτιμούσαν τα δύο ξεχωριστά κράτη το 2007, η αντίστοιχη προτίμηση πέφτει στο 35% το 2010. Η σημαντική βελτίωση των σχέσεων των δύο κοινοτήτων την περίοδο 2007-2010 από την σκοπιά των Τ/Κ γενικά μπορεί να χαρακτηριστεί ως μια μετακίνηση από αρνητικές προς ουδέτερες στάσεις αν και τα επίπεδα εμπιστοσύνης παραμένουν χαμηλά. Η αλλαγή αυτή δεν ήταν ικανή να αντιστρέψει τις αυτονομιστικές τάσεις της Τ/Κ κοινότητας, την απογοήτευση από τους Ε/Κ και την Ε.Ε και την δυσαρέσκεια στη διαχείριση των εσωτερικών της Τ/Κ κοινότητας από τον Μεχμέτ Αλί Ταλάτ που βρήκε διέξοδο με την εκλογή Ντερβίς Έρογλου. Η επικράτηση του Κόμματος Εθνικής Ενότητας (UBP) το 2009 και η εκλογή του Ν. Έρογλου στην ηγεσία της Τ/Κ κοινότητας το 2010 μπορεί να προκαλεί μια δυστοκία στις συνομιλίες αλλά η τάση για βελτίωση των διακοινοτικών σχέσεων στην Τ/Κ κοινότητα συνεχίζεται μέχρι σήμερα, κάτι που μπορεί να αποδοθεί σε τρείς κυρίως λόγους. Την αλλαγή ρητορικής του Ν.΄Ερογλου από την επιδίωξη των δύο κρατών στην επιδίωξη της διζωνικής-δικοινοτικής ομοσπονδίας, τις συνεχιζόμενες συχνές διελεύσεις των Τ/Κ από τα οδοφράγματα και συνακόλουθη επαφή με τους Ε/Κ που αποδεδειγμένα αυξάνει τα επίπεδα εμπιστοσύνης προς τους Ε/Κ, και την πρόσφατη τριβή με την Τουρκία για την εφαρμογή οικονομικών μεταρρυθμίσεων, τις επεμβάσεις στα εσωτερικά της Τ/Κ κοινότητας, και αυξανόμενο εποικισμό, που οδηγεί σε περεταίρω πτώση εθνικιστικών Τουρκοκεντρικών τάσεων στην Τ/Κ κοινότητα. Συγκεκριμένα, σε διαχρονική έρευνα με αντιπροσωπευτικό δείγμα (Ν=2000) και από τις δύο κοινότητες, με συλλογή δεδομένων τον Απρίλιο του 2010 και 7 μήνες μετά τον Νοέμβριο/Δεκέμβριο 2010, στην Τ/Κ κοινότητα παρουσιάζεται μια περεταίρω βελτίωση της ποιότητας των διακοινοτικών σχέσεων απέναντι στους Ε/Κ σε μια σειρά από μεταβλητές όπως για παράδειγμα μείωση του αισθήματος απειλής από την Ε/Κ κοινότητα, αύξηση της εμπιστοσύνης, ποιότητας επαφής με Ε/Κ και θετικότερης στάσης απέναντι τους. Οι πολύ πρόσφατες αρνητικές εξελίξεις στις σχέσεις Τ/Κ –Τουρκίας πιθανότατα να ενδυναμώσουν ακόμη περισσότερο την υπάρχουσα τάση βελτίωσης των διακοινοτικών σχέσεων με τους Ε/Κ αλλά αυτό δεν σημαίνει ότι οι κινητοποιήσεις θα αποκτήσουν αυτόματα και περιεχόμενο παρόμοιο με τις κινητοποιήσεις πριν το δημοψήφισμα του 2004 για λύση διζωνικής-δικοινοτικής ομοσπονδίας εκτός και αν η αγανάκτηση των Τ/Κ απέναντι στην διακυβέρνηση του UBP και την στάση υποτίμησης και εξάρτησης από την Τουρκική κυβέρνηση συνοδευτεί με σοβαρές ενδείξεις ότι η Ε/Κ πλευρά επιδιώκει την λύση του κυπριακού αλλά σε πλαίσια τέτοια που θα παρέχονται αρκετά περιθώρια αυτονομίας της Τ/Κ κοινότητας και ενισχυμένης διζωνικότητας, στα πλαίσια μιας διζωνικής/δικοινοτικής ομοσπονδίας. "Χέρι με χέρι όλοι μαζί ενάντια στο φασισμό"
ΟΦΕΙΛΟΥΜΕ να συμβιώσουμε για να διατηρήσουμε την κυπριότητα του τόπου μας. Να ζήσει για πάντα η Κύπρος και ο λαός της! Πάνω που 50 000 η συμμετοχή στη γενική απεργία τζιαι στο συλλαλητήριο κοινοτικής ύπαρξης των Τουρκοκυπρίων. Ζωντάνια, παλμός αποφασιστικότητα. Πολλά μιαλλύττερο το πλήθος που το προηγούμενο συλλαλητήριο, με πιο πολλύν πείσμα τζιαι διάθεση για αγώνα. Τα κεντρικά συνθήματα στην σκηνή ήταν “Δεν μπορείς να σωθείς μόνος. Μαζί μπορούμε να επιβιώσουμε” “Ενάντια στη διακυβέρνηση με διαταγές” τζιαι “Αυτή η χώρα είναι δική μας – εμείς θα την κυβερνήσουμε” που εστέκαν μπροστά που 2 μεγάλες σημαίες της Τουρκίας τζιαι της ΤΔΒΚ που είχαν τοποθετηθεί που τα εψές στο πίσω κτίριο. Μεγάλες σημαίες της Τουρκίας τζιαι της ΤΔΒΚ υπήρχαν τζιαι σε 2 άλλα κτίρια δίπλα – της κυβέρνησης τζιαι του στρατού. Η ατμόσφαιρα ήταν ηλεκτρισμένη. Υπήρχαν ήδη 5-6 χιλιάδες στην Ινονού, στες θκιο μερκές τζιαι πάνω στο ενετικό τείχος. Εμφανής η παρουσία της αστυνομίας αλλά εν εφαίνετουν ότι εμπορούσεν να κάμει τζιαι πολλά πράματα. Το κλίμα ήταν μεν γιορταστικό αλλά υπήρχεν τζιαι η ένταση στον αέρα. Όι μόνον λόγω της υπαρξιακής διάστασης της κινητοποίησης αλλά τζιαι λόγω του πολιτικού πλουραλισμού τζιαι των ισορροπιών πάνω στες οποίες ήταν χτισμένος. Πρώτον στην πλατεία εμπήκεν το κομμουνιστικό συνδικάτο Ντεβίς τζιαι τελευταίον το ριζοσπαστικό κόμμα Νέα Κύπρος. Η συνδικαλιστική πλατφόρμα αποφάσισεν εχτές τα επίσημα συνθήματα τα οποία υπόγραψεν αλλά η αριστερή συνιστώσα εν εκατάφερεν να περάσει την θέση για απουσία όλων των εθνικών σημαιών. Έτσι μερικά συνδικάτα όπως η Κάμου Σεν των δεξιών δημοσίων υπαλλήλων τζιαι τμήμα της Μπες Σεν των δημοτικών υπαλλήλων, όπως τζιαι το ΔΗΚΟ του Σερντάρ Ντεκτάς είχαν. Υπήρχαν ακόμα μερικές άλλες σκόρπιες που μεμονωμένους διαδηλωτές τζιαι μέσα σε μερικά άλλα μπλοκς περιλαμβανομένου τζιαι του Ρεπουμπλικανικού Τουρκικού Κόμματος. “Η κυρία Ντεκτάς είναι εδώ μαζί μας” ανακοινώθηκεν σε κάποια φάση. “Εννά βρέξει αλωπως” σχολιάζει ο Σενέρ Ελτζιήλ που το άλλο μικρόφωνο. “Είτε βρέξει, είτε σιονίσει όμως, εμείς δαμέ θα είμαστεν” προσθέτει. Τα κυρίαρχα συνθήματα ήταν “Υπήρξαμεν, υπάρχουμεν τζιαι θα υπάρχουμεν”, “Εμείς είμαστεν ΚΥΠΡΑΙΟΙ Τούρκοι, εσύ ποιος είσαι κύριε;” “Ειρήνη. Λύση τώρα.” “Κύπρος ανεξάρτητη, ενωμένη ομοσπονδιακή”. “Ούτε όμηρος της Τουρκίας ούτε παράρτημα των Ελληνοκυπρίων”. “Πιάσε τα πακέτα σου τζιαι φύε” τζιαι η ΚΤΟΕΟΣ των καθηγητών μήπως τζιαι δεν το εμπεδώσαν κάποιοι, είπεν το πιο ρητά “Άγκυρα άσε μας ήσυχους”. Η αστυνομία εδοκίμασεν να επέμβει αλλά εν εμπορούσεν να κάμει τζιαι πολλά πράματα. Ο Σενέρ Ελτζιήλ ήταν πάνω στην σκηνή τζιαι εκαλωσόριζεν τα μπλοκς. Ακόμα τζιαι το μπλοκ του Γιασεμί γύρω που την εφημερίδα Αφρίκα εμπήκεν μέσα στην πλατεία με κεντρικό πανώ “΄Χάτε μπάρρα” τζιαι τη φωτογραφία του Τσεμίλ Τσιτσέκ (αρμόδιος για βόριεα Κύπρο υπουργός του Ερτογάν) δίπλα τζιαι πίσω μια σημαία της Κυπριακής Δημοκρατίας η οποία εχειροκροτήθηκεν που σημαντική μερίδα του πλήθους. Ο Ελτζιήλ εφώναζεν “Που είσαστεν φασίστες; Περνά σημαία της Κυπριακής Δημοκρατίας. Εν τολμάτε να την αφαιρέσετε!” Τζιαι εσυνέχισεν “Κύριε Ερτογάν, είναι και δική μας αυτή η σημαία. Και εσύ είσαι εγγυητής αυτού του κράτους. Πως μπορείς να λαλείς δεν το αναγνωρίζεις;” Τζιαι ο Ατνάν μετά στην ομιλία του εξήγησε ότι είμαστεν και Κυπραίοι και Τούρκοι άρα μπορούμεν να έχουμεν τζιαι Κυπριακές τζιαι Τουρκικές σημαίες. Ένας τύπος έφερεν τζιαι έναν γάρο με πανώ “Είμαι ο τελευταίος Κυπραίος. Μην με αφήσετε να εξαφανιστώ”. Θέλουμεν αυτονομία, να κυβερνούμεν εμείς τους εαυτούς μας τζιαι τον τόπο μας. Να έχουν τ/κ τον έλεγχο της αστυνομίας, της πολιτικής άμυνας, της εθνικής φρουράς, της κεντρικής τράπεζας στη βόρεια Κύπρο. Θέλουμε αυτοδιοίκηση τζιαι θέλουμε ειρήνη. Να λυθεί το κυπριακό άμεσα. Να μπούμε στην Ευρώπη. Μουσική δυνατή, ωραία τζιαι γλυτζιά. Μπέλλα τσιάο στο γνώριμο, που την προηγούμενη τους εξέγερση, τουρκοκυπριακό τέμπο. Τοπικά τα συγκροτήματα της σκηνής. Οι μερικές δεκάδες ε/κ που ήταν παρών εσιοκαριστήκαν τζιαι εντυπωσιαστήκαν που την φάση. Τρομερή εμπειρία πάντως, ιστορική μέρα για την Κύπρο, την βόρεια δηλαδή, τζείνη που έσιει ζωήν με την πολιτική έννοια του όρου. Κάτι πάω να του πω για τη Λήδρας το δείλις αλλά εν μου φκαίννει. Σούζω την κκελλέ μου τζιαι σιερετώ. Αναμένουμε το ίδιο από την Ελληνοκυπριακή κοινότητα. Βγαίνουμε στις πλατείες και έχουμε δυο βασικές απαιτήσεις. Ένα – να κυβερνούμε εμείς τον τόπο μας, Δύο – να βρεθεί λύση όσο το δυνατόν πιο σύντομα για να επανενωθεί η Κύπρος. Είναι πολύ σημαντικό, οι Ε/Κ να βγουν και αυτοί στους δρόμους, να διαδηλώσουν την επιθυμία τους για λύση. Αυτό θα στείλει ένα πολύ θετικό μήνυμα σε όλο τον κόσμο. Δεν υπάρχει νόημα μια πλευρά μόνο να θέλει λύση. Οι μαζικές οργανώσεις των Ε/Κ, θα μπορούσαν για παράδειγμα να οργανώσουν την ίδια ώρα με μας, μια διαδήλωση στην Πλατεία Ελευθερίας ή κάπου αλλού. Αυτό θα ήταν ένα πολύ σημαντικό μήνυμα για τον κόσμο. Αυτό που λέω δεν χρειάζεται συντονισμό. Οι οργανώσεις στις δυο πλευρές απλά θα εκφράσουν την κοινή τους βούληση σχετικά με το θέμα. Δεν ζητώ από τους Ε/Κ συντρόφους και συμπατριώτες μου να έρθουν στον βορρά να μας στηρίξουν. Εμείς έχουμε τις μάζες. Αυτό που είναι σημαντικό είναι να ενεργοποιήσουν και αυτοί τις μάζες, έτσι ώστε να προβάλουμε την κοινή μας βούληση για λύση, την επανένωση της Κύπρου που θα κυβερνάται από τους Κύπριους χωρίς ξένες επιβουλές". "We are determined to defend our democratic rights to the end. We expect the same also of the Greek Cypriot community. We go out to the squares and we have two basic demands. One: that we should ourselves govern our place, Two: that a solution is found as soon as possible for Cyprus to be reunited. It is very significant for the Greek Cypriots to also go out into the streets, to demonstrate their desire for a solution. This will give a very positive message to the whole world. There is no sense for only one side to want a solution. 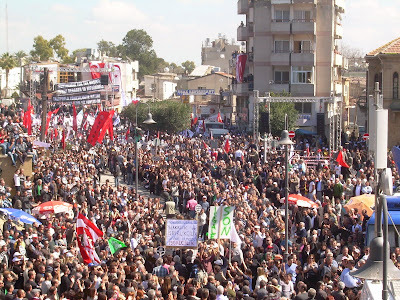 The large organisations of the Greek Cypriots, they could for example, organise for the same time as ours, a demonstration at Eleftheria (Liberation) Square or somewhere else. This would give a very significant message to the world. What I am talking about does not need to be coordinated. The organisations of the two sides can simply express a common will regarding this matter. I am not asking my Greek Cypriot comrades and compatriots to come to ‘the north’ to support us. We can marshall the masses. What is significant is that they also activate the masses, so we can project the common will for a solution, the reunification of Cyprus and of Cyprus being governed by Cypriots without foreign impositions".